Do you guys remember those Chicken in a Biskit crackers back in the day? I honestly don’t know if they make them anymore but I remember when I was growing up my family almost always had them in the pantry. I personally thought they were gross but my mom and brother ate them by the handfuls. 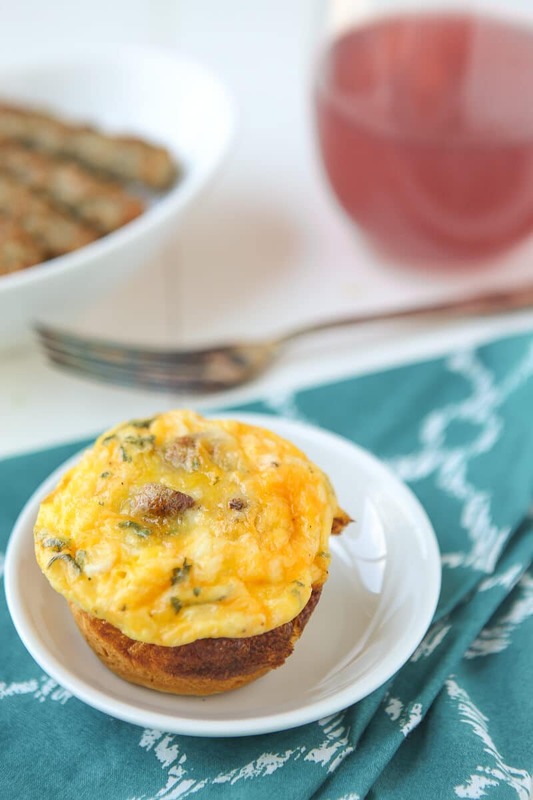 These chicken in a biscuit breakfast muffins really have nothing to do with those crackers other than I thought it was a fun name for this new egg breakfast muffin recipe, especially since they are basically eggs + chicken sausage all in a biscuit muffin. 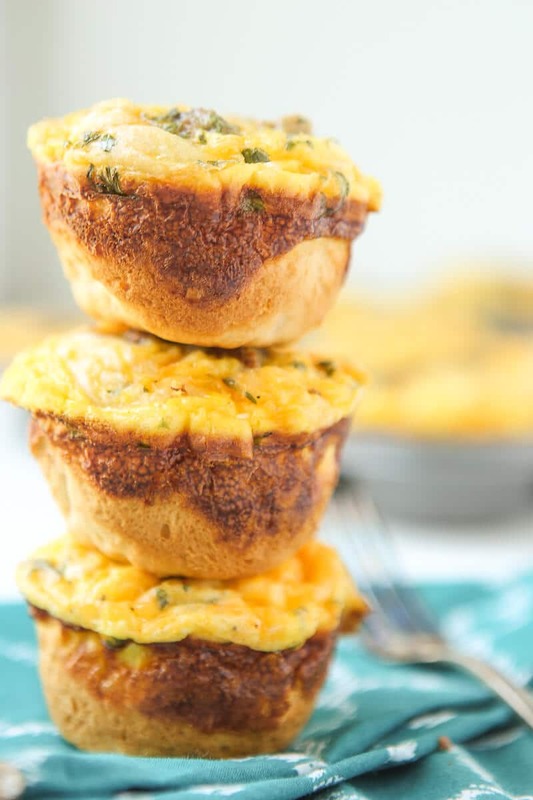 Or chicken in a biscuit breakfast muffins! I’m a huge fan of easy breakfast muffins if it wasn’t already apparent from my hash brown muffin and banana bread muffins. 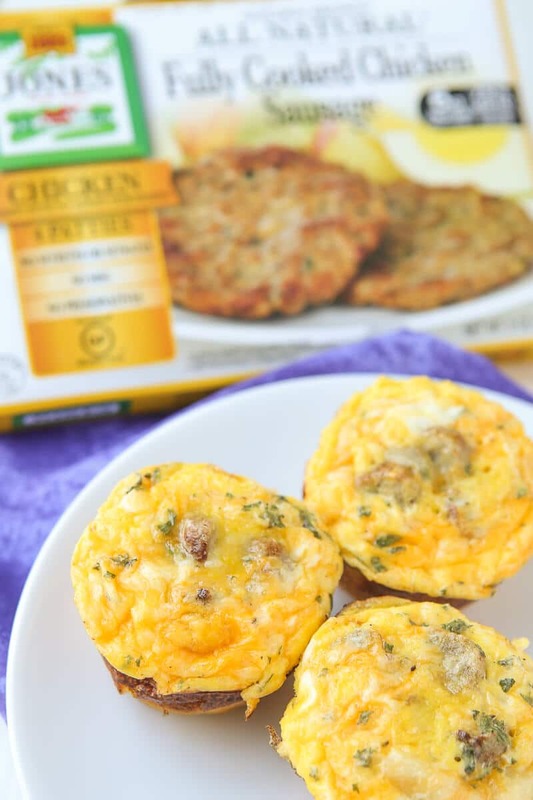 These ones are a new favorite because they combine a flaky biscuit with flavorful chicken sausage, eggs, and cheese. They’re perfect for a baby shower, bridal shower, brunch, or even just for a quick make ahead breakfast. Making these breakfast muffins is as simple as 1-2-3. 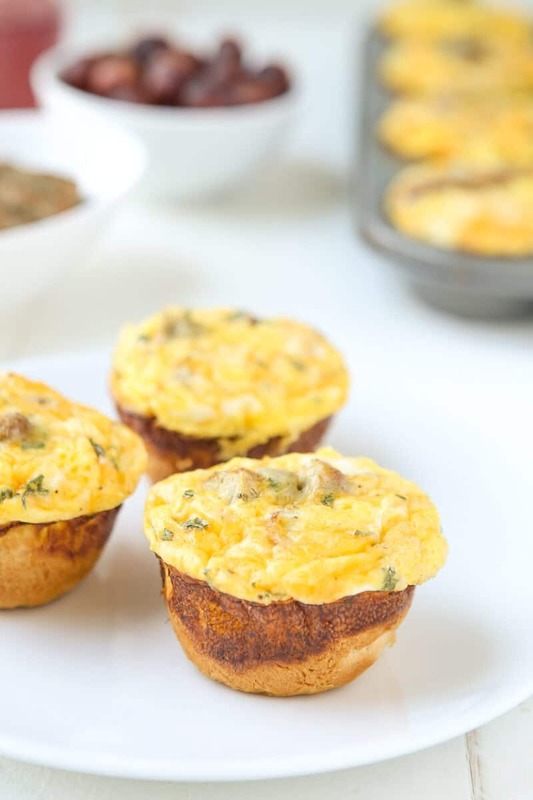 Place half of a refrigerated biscuit in the bottom of a muffin tin, top it with Jones Dairy Farm fully cooked Chicken Sausage (available in both links and patties in your freezer aisle, find in your local area here), then top with an egg mixture. One, two, three. Bake until the egg layer is completely cooked, and you have the perfect grab and go breakfast that everyone will love! These types of muffins are seriously my favorite thing to make for parties, especially brunch parties. I made some for my sister’s bridal shower a couple of years ago, for my son’s Pajama Time birthday party (all breakfast food), and will likely make them for my other sister’s bridal shower this summer. People love them, they’re filled with protein, and they’re one of the few things that taste good both hot and at room temp. Have you tried Jones Dairy Farm’s chicken sausage? Do you prefer links or patties? This post is sponsored by Jones Dairy Farm as part of my ambassadorship. All opinion are 100% honest and my own. 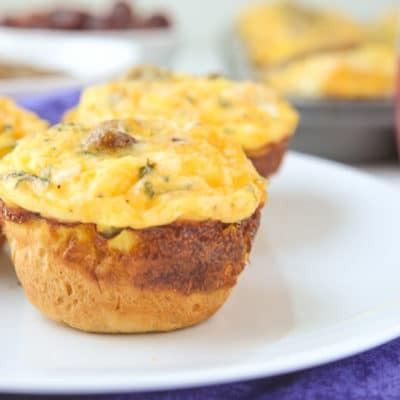 A simple sausage and egg breakfast muffin recipe that combines your favorite breakfast flavors in a delicious biscuit cup. Brown chicken sausage in a saute pan over medium-high heat until lightly brown on both sides. Spray one 12-cup muffin tin with non-stick baking spray. Place one half of a biscuit in each muffin tin and press to the bottom and up along the sides, making a cup. Press a quarter of a chicken sausage patty in each cup on top of the biscuit. Mix eggs, milk, cheese, salt, pepper, and parsley together. Top each sausage biscuit with about 1/8 cup of mixture. Bake for 15-20 minutes or until egg is fully cooked. Remove from oven and serve hot or at room temp. Great recipe! I’ve never tried chicken sausage before. This is my kind of breakfast! Great for breakfast on the go!